if you are planning to play on Nostalrius, following the instruction in this guide will lead you there in no time! This guide was completly reworked in the beginning of March '15, so many of the questions in this thread might relate to problems you will never encounter. The old guide can be found here. For your absolute convenience, the Nostalrius community now provides its own WoW installer, that you can use to install WoW. All credits go to Narkon. If you have another game client or a different operating system then windows please read the F.A.Q. at the bottom of this post. If you have followed the instructions on the download page, you should have successfully downloaded all the data you need to set up your wow installation (5.2 GB). At first you need to extract the downloaded data. To do so, navigate into your download folder (e.g. 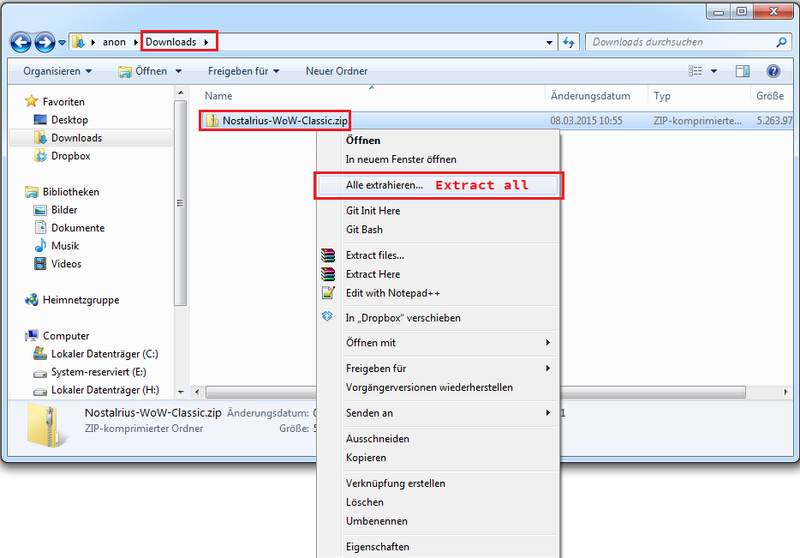 "C:\Users\anon\Downloads"), right-click on the downloaded ".zip"-file and click on "extract all". This will open a dialog window asking you to choose the directory the data should be extracted to. There is no need to change anything, so just hit "Extract". The extraction will take some time and you need to have additional 5GB space on your hard drive. You should now have a new folder in the same directory as your ".zip"-file called "Nostalrius-WoW-Classic" (not to be confused with "Nostalrius-WoW-Classic.zip"). 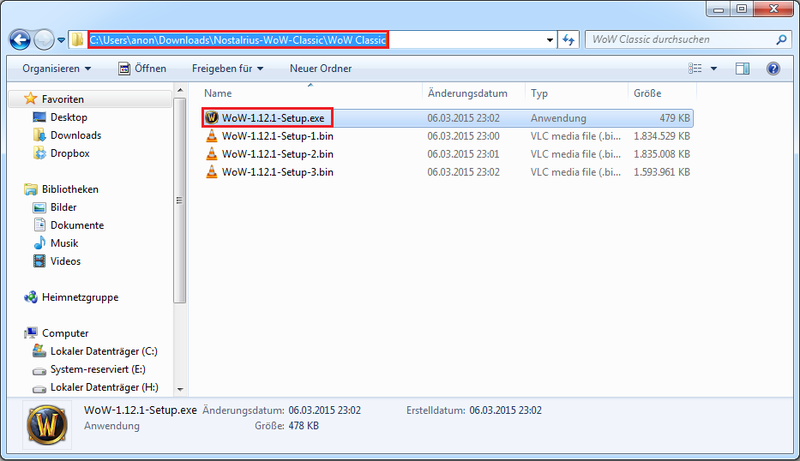 If you open the folder and then open the containing "WoW Classic" folder, you find a setup file called "WoW-1.12.1-Setup.exe" that you should execute to start the installation. You will then be asked to authorize the installation, which you should do. Afterwards the installer is started. You can click "Next", "Next", "Next", "Ok", etc. for a perfectly standard installation or change some settings for your convenience. Using the standard configuration of the installer is recommended for beginners. The installation will take some time to finish. If you haven't yet created an account for the game (separate from forum! ), create one. You should now be able to connect to the server. There is no Email activation needed. Use your log in credentials to log in and play the game. Have fun! . 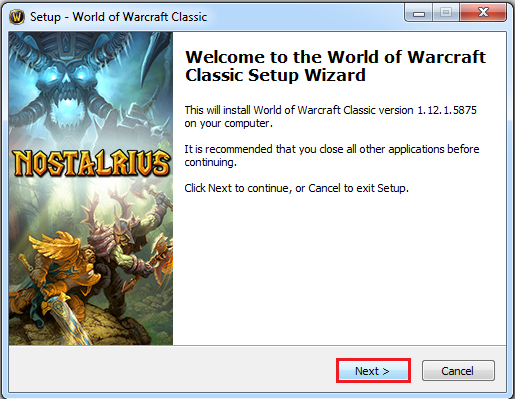 If the installation was a success you can remove "Nostalrius-WoW-Classic" and "Nostalrius-WoW-Classic.zip" from your download directory to free space on your drive. Add-ons are in-game application that might enhance gaming experience by simplifying certain tasks. Since add-ons are depended on the WoW installation, you need add-ons for classic WoW with patch 1.12.1. Some add-ons can be found in this thread or here (from Classic WoW) and here (from Vanilla WoW). I recommend searching the web for add-ons you like and then look if they are contained in those packages. 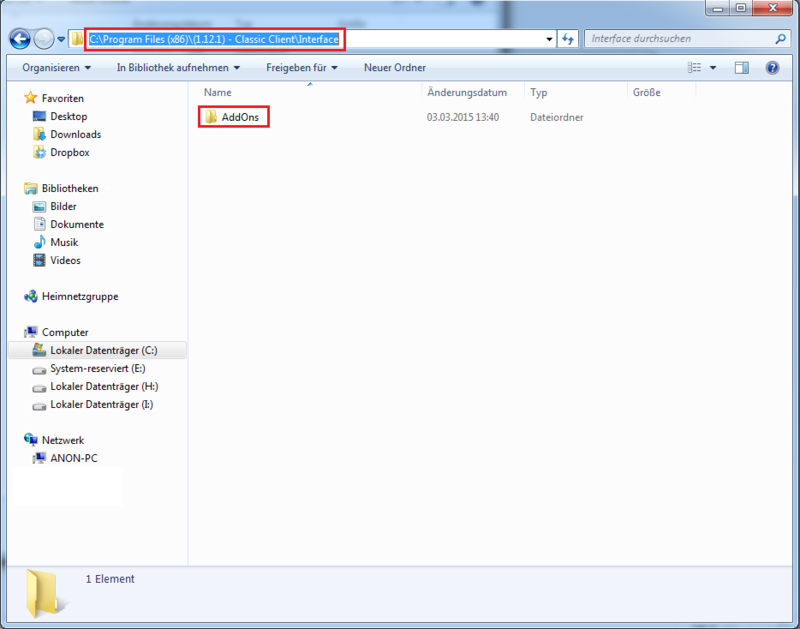 Add-ons must be copied into the "AddOns" folder within the interface folder of you installation. Please note: If there is no "AddOns" folder in the "Interface" folder, just right-click and create one! Please do not discuss add-ons in this thread! 1) Can I have multiple WoW installations? Yes, you can have as many WoW installations as you want. Also, installation does NOT interfere with Blizzards official installation. 2) Have you tested all content you recommend? Mostly. The recommended installation as well as the tool to reconfigure your realmlist are both tested by me and the mods and can be considered save. However I did not test all the addon packages that I linked to. Proceed with care! 3) Will I get banned on official Blizzard servers if I play on Nostalrius? No. You might violate some Blizzard agreements (I don't know), but they want the money way to bad to ban you. 4) I already have a game client for 1.12.1, can I use it? If you already have an 1.12.1 client you downloaded to play on Feenix, Vengence, Rebirth or one of the other (not very well scripted) private Vanilla servers you can use it and do not need to download it again. You only need to change the realmlist. "realmlist.wtf" is a file in your WoW folder that tells WoW to which server it shall connect. If you change the data in this file you can connect to Nostalrius without any problem. More information on this topic can be found in the old guide. If you have a standard installation, Nostalrius provides an easy tool to automatically adjust your realmlist. Just download and execute this tool! The tools searches for your WoW installation and rewrites the "realmlist.wtf" so it will connect to the correct server and realm. However, if you have a custom WoW path, this might not work. Feenix is a special case: Some downloads provided by Feenix/WoW-One have an corrupted "wow.exe". This means, that they changed the way the ".exe" works, so that it will always connect to Feenix. A solution is to replace the corrupted "wow.exe" with an uncorrupted one. Rebirth provides one you can download here. You need to replace the old "wow.exe" in your game folder (e.g. "C:\Program Files(x86)\(1.12.1) - Classic Client") with the freshly downloaded one. 5) I have MacOS / Linux , can I still play? Yes, both MacOS and many Linux distributions support WoW 1.12.1 in a very good fashion. A well written guide for Linux can be found in the Beginner's Guide [Linux] by ozzky. A Mac client can be downloaded here. 6) For some reason, I can't play. What can I do? 7) I (accidentally) connected to the wrong realm and now can't change my decision, what can I do? If you connected to one of the wrong realms (the development realms) you might be unable to simply select a new realm. If you have a standard installation, Nostalrius provides an easy tool to fix this for you. Just download and execute this tool! Last edited by Kill on Wed Mar 11, 2015 10:20 am, edited 61 times in total. Should be moved to announcements. after installation don't lauch the wow client. first edit the realmlist.wtf as described in the images above. this is to prevent any unwanted patching. about multiple installations: if you have a super fast network you can put the installation folder on a network drive. or even on a external harddrive. it is not a needed installation, just having the folder and the wow.exe icon is enough to get it to work. For questions and/or problems during stress test session, you might find good advise in this IRC channel. kovenant wrote: after installation don't lauch the wow client. This is not a issue, because both tested clients don't have Blizzard servers as standard entries, but private 1.12.1 servers. There will be no auto-patching. I'm switching from seeding Feenix client to seeding this one. 1) I don't think the stupid Battlenet client cares about old WoW versions, so there shouldn't be any problems unless you put different versions of the game in the same folder, in which case they'll destroy each other trying to work. So just... don't do that. It's not hard putting each in its own separate folder; avoid any file name or version conflicts. 3) It does violate Blizzard's terms of service, and the private servers themselves violate copyright, but Blizzard couldn't care less about any of this. If you play retail, they'll just be happy to see money from you. They won't care what other versions of the game are installed on your computer or what you do with them. Every time I see that name and picture I think of that sound effect from Super Mario 64. You know, the one the turtle makes when you talk to it? Drain wrote: Every time I see that name and picture I think of that sound effect from Super Mario 64. You know, the one the turtle makes when you talk to it?